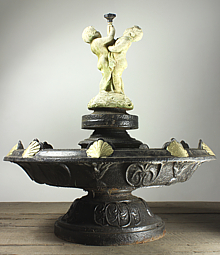 Up to the 19th Century, fountains were functional, connected to springs or aqueducts and providing drinking water and an area for bathing or washing clothes. 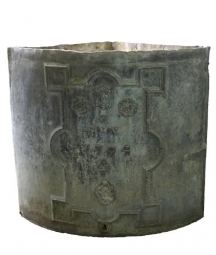 They were often decorative, to celebrate the builder or benefactor, such as the great Baroque fountains of Rome which were sponsored by the Popes. 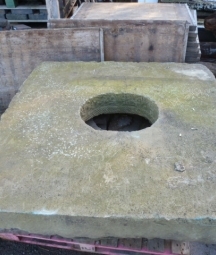 Fountains at that time had to be fed by gravity. 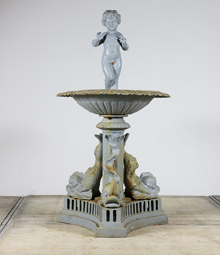 In the late 19th Century, development of mechanical pumps and the advent of improved plumbing and water supply, meant that fountains then became purely decorative. 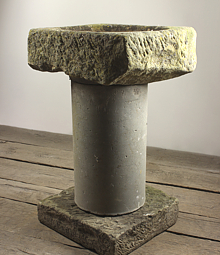 A lot of major cities and towns throughout Europe embarked upon a programme of building fountains in public areas from the mid 1800s. 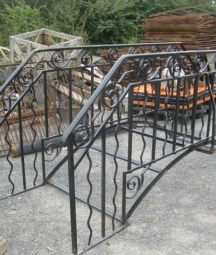 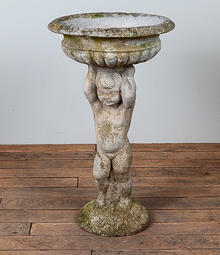 In a garden context, fountains or water features, can fulfil a number of roles. 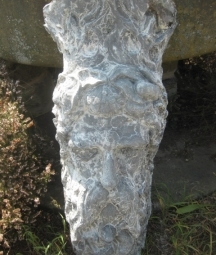 They can supply movement, the sound of running water can block sounds of traffic, they can be decorative and humans simply have an affinity to water, such an important element for our survival. 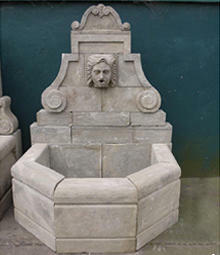 While formal tiered fountains may be perfect for a large public space, and we usually have in stock a few larger stone fountain surrounds and centrepieces, most people have smaller scale spaces they can use, and with ingenuity all sorts of material can be used to make a fountain. 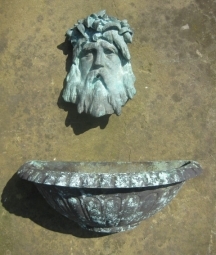 Old stone troughs, for example, make perfect reservoirs from which water can be pumped to cascade out through a lead or stone mask, mounted on a wall. 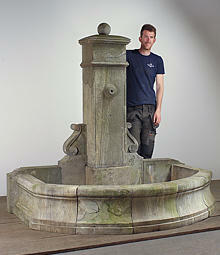 We also sell stone wall fountains, usually modelled on a typical fountain from a French Village square. 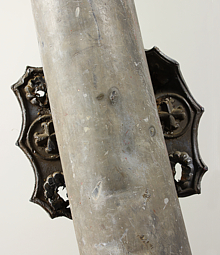 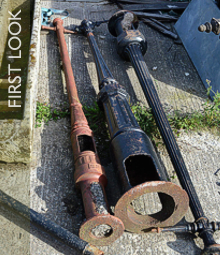 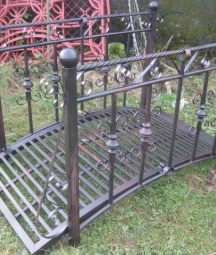 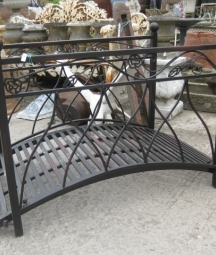 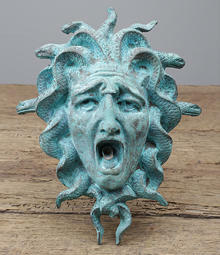 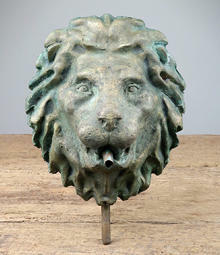 We have all types of spout, whether an antique Indian stone spout, lead, bronze and cast iron classical masks. 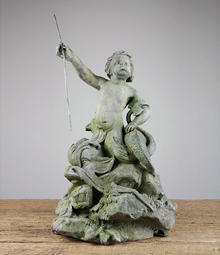 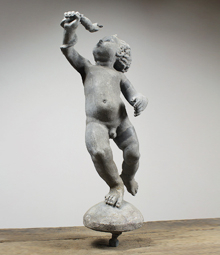 We usually have a lead fountain or two, typically in the form of a putto holding a shell or bowl aloft. 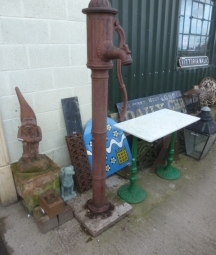 Some of our customers convert old village pumps into functioning water features, with a water house hidden within the spout. 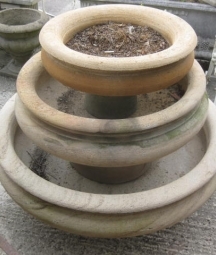 Alongside purpose-built fountain centrepieces, many urns, planters or statues could easily be converted to work as a fountain centrepiece, it is usually just a matter of how to conceal the water supply pipe and then find a suitable water reservoir/container/tank in which it can sit so water can be circulated.